Air Canada will begin direct flights between Vancouver and Melbourne from December 3 in a seasonal service stretching through to February 4, 2018. 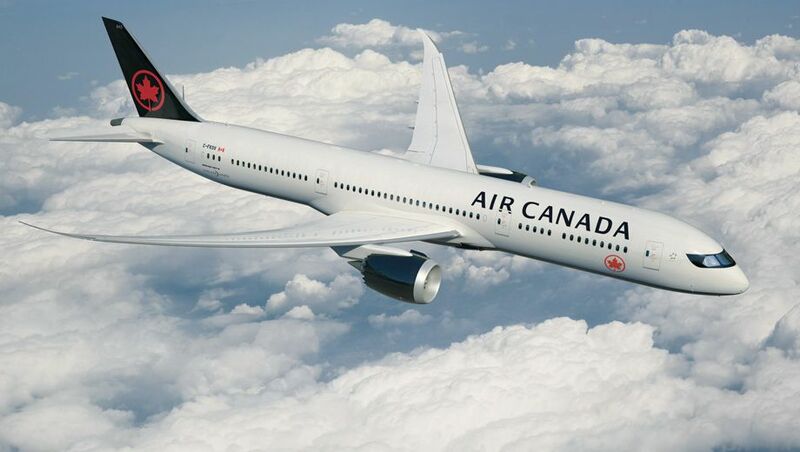 The 7.30am arrival into Vancouver will slot into connections from Air Canada's hub to score of destinations across Canada and the US. While the service is designed to tap into high travel demand during the northern winter, it will also help Air Canada gauge support for potential expansion of the Melbourne-Vancouver route beyond the peak season. "By operating the only non-stop service between Melbourne and Canada we are making it easier than ever before for Victorians to experience Canada's unsurpassed winter attractions, which include some of the world's leading ski resorts in British Columbia and Alberta," says Paul McLean, Air Canada's General Manager for Australia and New Zealand. Melbourne is the third city in Air Canada's Australian footprint, with the airline already flying daily to Vancouver from Sydney and Brisbane. 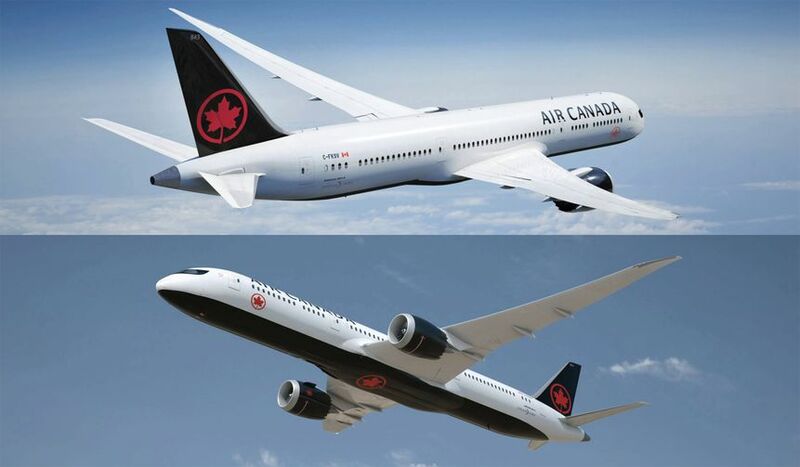 Air Canada's Boeing 787-9 Dreamliner – which will also sport the airline's bold new livery, shown above – sports 30 lie-flat business class seats which Air Canada tags as 'executive pods'. These are arranged in a 1-2-1 layout to provides direct aisle access for every passenger, with the solo seats angled towards the window while the two centre seats are angled slightly towards each other. Each seat extends extends to an 80 inch fully flat bed dressed with a 100% cotton duvet and, for that extra touch of indulgence, an espresso and cappuccino service featuring Lavazza coffee. Other creature comforts include an 18 inch touchscreen video panel and controller and an amenity kit featuring Canadian-made Escents aromatherapy products. 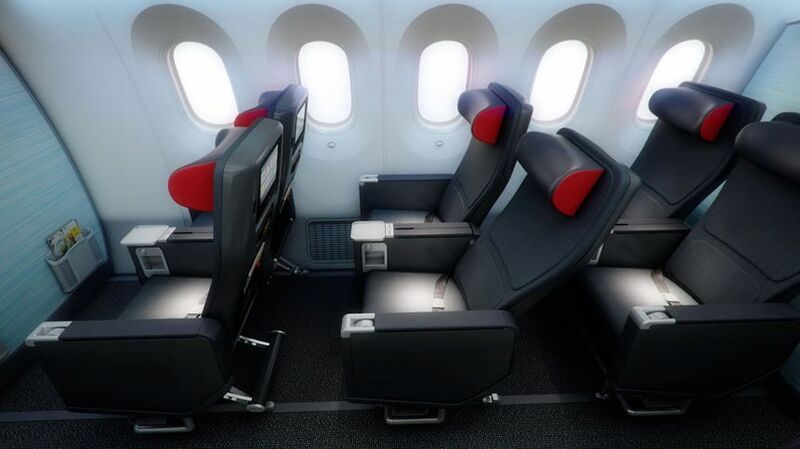 Passengers get a 19.5 inch wide seat with 38 inch pitch and a 7 inch recline. 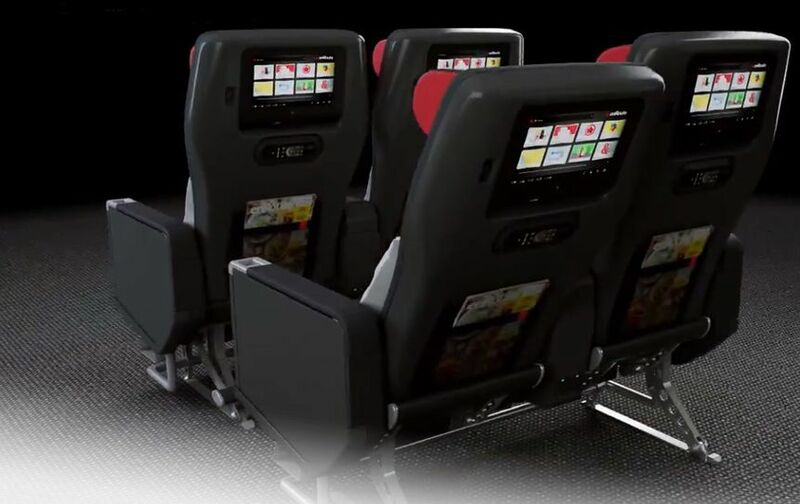 Each set has its own 11 inch touchscreen panel, USB and AC power socket. The rest of the 787 is given over to 247 economy seats arranged three-across. 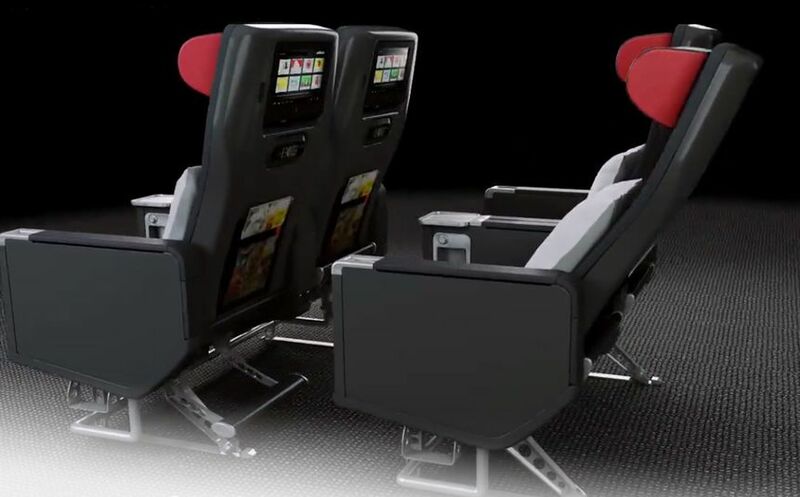 The 17.3 inch wide seats have a 5 inch recline and 31 inch pitch, although their slimline design should afford a bit of extra room around the knees. To take your mind off the squeeze there’s a 9 inch touchscreen with a USB port and shared AC sockets. 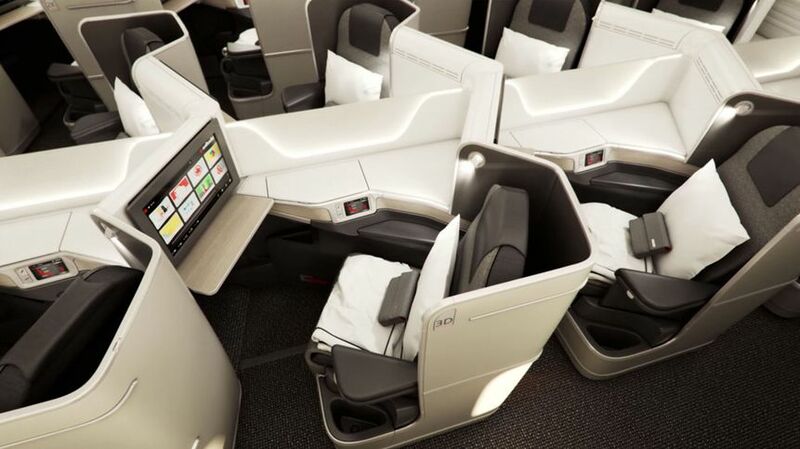 The Dreamliner's cabin has been designed for a “contemporary, sophisticated” look, the airline says, using warm natural textiles and fabrics, while the colour palette is based in slate grey “with hints of Canadian red and celeste blue”. The new Melbourne-Vancouver services will provide for Aeroplan Loyalty Program accumulation and redemption, with eligible customers enjoying priority check-in, Maple Leaf Lounge access, priority boarding and other benefits. Air Canada's business class travellers, Aeroplan Altitude Elite 50K, Elite 75K and Super Elite 100K members and their Star Alliance Gold equivalents will be able to relax pre-flight at the Air New Zealand lounge which opens on May 9. There is a real market in Victoria that would want travel to Canada to explore there wonderful country. It's a no brainer that they make it a regular flight. I'm sure there is also people from Canada that would also love to explore Australia. I also love the interior, fit & finish of their Dreamliner. Looks smart! "There is a real market in Victoria that would want travel to Canada to explore there wonderful country....there is also people from Canada that would also love to explore Australia." Fully agree if referring to tourist peak periods during Canadian ski /AU summer season and Canadian summer season. "It's a no brainer that they make it a regular flight." This could make excellent sense, especially with some people now reluctant to include an LAX stopover, or indeed an American stop altogether. Canada has become increasingly common, especially with cruises, this could be a great market for AC. "...some people now reluctant to include an LAX stopover, or indeed an American stop altogether." 1st of all, everyone & his bags arriving LAX are regarded as entering the U.S. and therefore must clear custom & immigration. 2ndly for your nex flight to Canada, U hope U already got your boarding pass during check-in earlier in AU and connection is in the same LAX terminal for bag-drop onto your flight(Otherwise, U do the whole check-in ritual once again @ LAX). Next, U endure the notoriously long TSA/security queue b4 U head to your gate. Finally, U arrive Canada to go thru another round of Canadian custom & immigration ritual....all the hoops U hv to go thru is mind-boggling especially for families traveling with young children. Upon YVR arrival, U skip all Canadian formalities and clear only security. Nex U take a short walk to proceed thru U.S. custom & immigration within the same terminal complex where they show U a photo of your bags(handled by AC) to confirm they're yours(actually retrieving & inspecting bags in front of pax is random & rarely done) and then AC will forward them to your nex U.S. flight. Afterwards, U are off to your U.S. departure gate nex door. Many AU travelers are beginning to discover this easy route by AC(+UA codeshares) via YVR to reach U.S. cities such as EWR, IAD, ORD, DFW, IAH, SEA, etc. in which total travel time is competitive vs connecting @ LAX where it's always crowded & sometimes chaotic. For connecting pax, all gates are under 1 roof @ YVR(In fact, all U.S. gates are practically located opposite side of all intercon/AU gates in the same concourse). That's not always the case @ LAX even if traveling with a single alliance e.g. connecting fm a QF flight @ TBIT to a AA flight @ T4. For all pax users, each LAX terminal(Except TBIT) is simply congested and @ least a bit out-dated. In contrast, YVR terminal design is airy/spacious & advanced and it never really feel crowded even @ peak times....no wonder SkyTrax rated YVR as the top airport in N.America(currently ranks 13th worldwide above BNE and far ahead of SYD) 7yrs in a row. I had a really bad experience with AirCanada, so they are not my favourite airline, but this is a great move. They are are really dominating the Australia / Canada route. When will Qantas get in on the act? QANTAS appears to be focusing on LHR, Europe and the US with their 787 aircraft on order for now. There are existing 747 aircraft that will need to be retired and replaced with 787 aircraft on a number of existing routes too with some 747 aircraft kept to operate routes that still require a four engine aircraft. QF75 and QF76 are 747 flights between SYD and YVR that operate on a seasonal basis. No doubt eventually these will become seasonal services on the 787 if continued. QANTAS normally has some aircraft undergoing routine maintenance rotating through the various aircraft except in periods of high demand where seasonal flights operate. Canada would be an interesting place for them to fly regularly but I don't think it's one of their priorities to fly there on a regular basis right now. sorry to hear you had a bad experience 'cause i really think they're the best. i mean....they really know what to do, don't bother asking the questions, they already know your issue and they will accomodate if can. Depends if you're a demanding person or not.They are better then Emirates actuallyto my eyes. "They are are really dominating the Australia / Canada route." Recall 10yrs ago, no one had ever tried to operate AU-Canada nonstop yr-round. Shortly afterwards circa 2008, AC launched it quickly after they took delivery of 77L/77W which was realistically the 1st type that has the required performance(e.g. block time for YVR->SYD can be nearly 1hr longer than LAX->SYD) AND op economics to sustain YVR-SYD even during off-peak seasons. Without any 777, QF couldn't match AC and thus remained as a seasonal operator. The pattern repeated last yr when AC added YVR-BNE not long after they took delivery of 788/789 which was again the 1st type that has the combo of performance AND op economics to sustain other daily YVR-AU mkts significantly smaller than YVR-SYD even during off-peak seasons. Without any 787 or 777, QF was again stuck in SYD-YVR and only seasonal. By Dec this yr, AC will be operating 3 YVR-AU routes(2 yr-round +1 seasonal) vs QF's single seasonal SYD-YVR. AC's dominance in AU-Canada mkt is no accident nor pure luck. "When will Qantas get in on the act?" Until 1) QF commit to convert a lot more of their 789 options/rights into firm orders, and then 2) wait for their deliveries and finally 3) actually deploy them on SYD-YVR yr-round as a start. 1) won't happen until after the 1st batch of 789 x4 are all delivered and deployed to generate sufficient financial performance data for AJ to chew on. This means 1) won't occur until 1H2018 @ the earliest. 2) typically means a minimum order lead time of 1.5-2yrs. 3) Even if QF magically prioritize deployment on this leisure-heavy route over other more profitable biz-heavy routes(e.g. SYD-PEK/SFO, MEL/BNE-DFW), we won't see any 789-enabled yr-round SYD-YVR by QF until 2020 @ the earliest. Given AJ's focus on QF profit maximization, 2022-23 is a more realistic time frame. Canada 3000, launch airline for the A330-200, flew YYZ/YVR/HNL/BNE/SYD/AKL/RAR/HNL/YVR/YYZ twice a week, once in each direction until end of 2001. SEP11 killed Canada 3000. The Canadians didn't support their airlines, like the yanks did. Not even with points I will ever fly AC to Asia or any long haul destination. 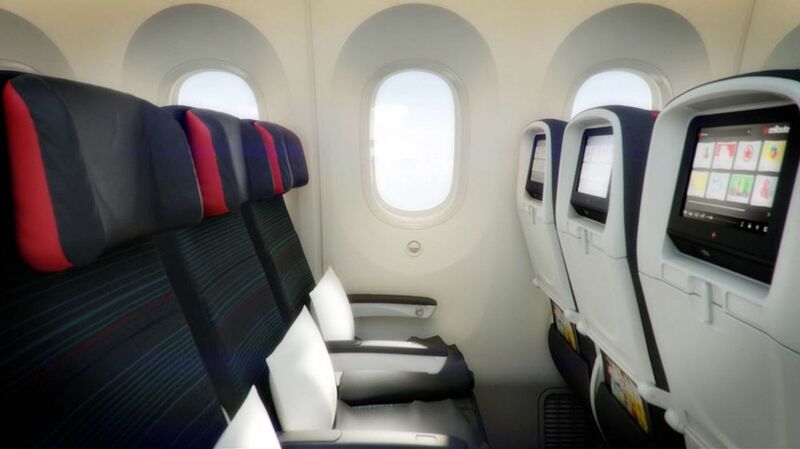 I'm size 36 pants and not that big, but those narrow seats in Economy in AC 773 and 788/9 are horrible like the ones in CA 773 (10 across).. so narrow even narrower than EK and EY dense aircrafts. Also, never pay for PE in AC is so cheap and bad... for the same price and just one short stop you have superior service to and better seats to MEL in QF and NZ (depends on One World or Star Alliance). I just flew AC and seats in the bulkhead are terrible, everyone in Economy passes to PE and take the empty seats, the food is the same as the Economy with the exception of the first Meal... JUST NOT WORTHY. Also... the quality of wines, amenity kit and headsets are much inferior in AC than NZ or QF... Believe me I just flew AC Premium Economy PEK-YVR and went to the back to take some photos from a window that was empty where try the economy seat..made me take a decision of not flying AC as possible. At least their A333 still having decent economy seats and they use it on European routes. What a nice refresh of the AC livery! This is a great move by Air Canada. 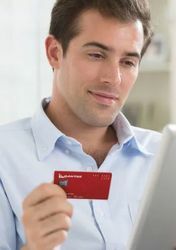 Test tbhe watersand get route eswtablished before Qantas are in any position toto try anything! As the saying goes: 1 Canadian is a friend, 2 is a party!Known for friendly service. Flew on CP air andf Canadian before merge and they were fantastic! This may effect the Brisbane route as not as many transferring passengers will be on the flights during that time. I think they're certain this route will become a regular, they seem to be just playing it conservative just in case things don't go they way they wanted to. "...they seem to be just playing it conservative." Which is the typical game plan whenever any financially-sane operator is launching any new ULH route to wherever. 1. Nature of traffic demand is highly seasonal and heavy in leisure fare /light in premium fare....far more so than YVR-SYD. 2. Will be the longest route in AC network(YYZ-HKG, a premium traffic heavier route, currently holds that title) and naturally, trip op cost(e.g. fuel) will also be among the highest...every empty seat during low season is a bigger loss than for other AC routes. Looks like Lifemiles just became useful again. Air Canada has a virtual monopoly of OZ/Canada flights & is generally very expensive. With real estate market completely stuffed, many will be looking for cheap fares. Just spotted some $1199 fares Syd/Sfo return fares 25Dec back mid Jan & $200 more if depart 26-31Dec. This is a much cheaper way to get to Canada, but for skiers it's now much cheaper to ski in USA than Canada, despite exchange rate. only good news for AC if they can sell all their overpriced seats. Apparently wholesalers have know about this for a while & have booked out all the cheaper seats. If they can't use them, they simply dump them at a much later date & they won't reappear as cheaper seats. 17.3" wide seats in Y. Sheer bliss compared with the 17.0" wide seats on the re-configured B777s from Sydney. Comment on "Air Canada to fly Melbourne-Vancouver from December"